What is an Ethical Will? In days of yore, people prepared a Last Will and Testament. The Will addressed the distribution of property and assets of the deceased. The Ethical Will was the Testament portion of this important end-of-life planning document. An Ethical Will enables us to speak words of truth before the end of our days on earth. We can share what life lessons we’ve learned in this lifetime. We can pass along our values and wisdom to our loved ones and to the world. Family and Friends: Your feelings about your nearest and dearest relationships; special words for individual loved ones. Life Lessons Learned: In love, work, challenges, travels, relationships, spirituality, etc. Your Favorites and Why: People, places, pets, experiences, music, art, food, objects, etc. Wealth and Charity: The meaning of money to you; saving, investing, donating to worthy causes. Your Greatest: Joys, ideas, actions, achievements – and why you regard them as the greatest. Your Worst: Moments, challenges, relationships, losses, sorrows – and what you learned from these experiences. Regrets: If you could do your life all over again, what would you do differently? Here’s an example of an easy way to start an Ethical Will. My father gave me a typed, framed list titled “12 Things to Remember” that has been on my desk or in my office since the 1970s. He gave one to me and one to each of my three brothers. Dad saw this list posted on a wall in a “Mom and Pop” restaurant in downtown Washington, D.C. The list was originally written by businessman Marshall Field, founder of the Marshall Field and Company department stores. This is an Ethical Will in its simplest form. You could expand on each idea with stories and paragraphs of ponderings. But I think this short list speaks volumes. I’m blessed that my Dad thought so much of these ideas, and thought so much of his children, that he shared these words of wisdom with us when we were young. What are your Ethical Will life lessons that you want to share with the world? Write them down and share them while you can. It’s never too soon to share your wisdom. Gail Rubin, CT, is a pioneering death educator, using humor and funny films to teach about end-of-life topics. She authored three books on end-of-life issues and coordinates the Before I Die New Mexico Festival, taking place October 30 to November 4, 2018 in Albuquerque, Santa Fe, and other towns. She’s also a Certified Funeral Celebrant. 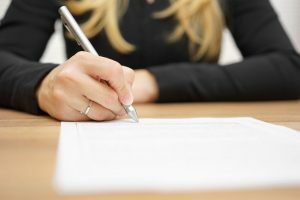 Download a free 50-point Executor’s Checklist from her website, www.AGoodGoodbye.com.